Finally, some good news for publishers. All year we’ve been hearing predictions that the book business is on its death bed — about to be completely transformed by ebooks, then eaten alive by pirates. Yet, despite recent reports to the contrary it turns out that book piracy is on the decline. Based on piracy loss estimates published by the International Intellectual Property Alliance and generated by the Association of American Publishers, book piracy dropped over 13% between 2005 and 2007 (the most recent year that data is available). In a remarkable piece of investigative journalism the New York Times has discovered evidence of widespread ebook piracy. Again. The surprise here is not that the paper has rediscovered piracy for the umpteenth time, but rather that, despite the paper’s many discoveries, it has failed to gain a deeper understanding of the issues surrounding piracy. Instead, the paper chooses to play to the worst fears of the publishing industry, while demonstrating a complete lack of understanding of what motivates consumers of digital media. NYT columnist Randall Stross theorizes that the widespread availability of pirated ebooks combined with growing consumer adoption of digital reading devices like the Kindle, may ultimately lead to massive piracy of the sort that the music business experienced during the Napster era. Apparently it’s just a matter of time before Kindle owning consumers pirates wake up the fact that they can save 10 bucks by downloading bootlegged ebooks from RapidShare instead of buying direct from Amazon. Find the book you want by searching the store that’s conveniently integrated into your Kindle device. Press the buy button. Yes, you just spent $9.99. Painless, wasn’t it? Find the book you want by searching the… Wait a minute. It turns out that RapidShare has no on-site search engine. Turn to Google or some other search engine to find the exact URL for the book you want to download. This might take a while, but fortunately pirates have loads of free time. Once you’ve found the exact URL you’ll discover that you can’t download the file immediately. Instead, you’ll be told that all of the free download slots are in use. You’ll have to try again in two minutes. Repeat this step until a slot opens up (it might be hours, it could be days). Alternately, consider paying for immediate access. For a mere 6.99€ you can download from RapidShare without waiting. That’s only 20 cents more than the price of the book you’re about to steal. A small price to pay for sticking it to The Man. Once you’ve downloaded your book you’ll need to find a way to move the file to your Kindle (Whispersync might be convenient, but it’s not the pirate way). Prepare for the likelihood of some slight formatting problems with your new book. In most cases you’ll be able to figure out the intended meaning of the poorly OCR’d text. And you’ll just have to get used to the page numbers that are embedded in the middle of each page. If publishers can learn one thing from other forms of digital media, it is the importance of a quality consumer experience. Consumers place a premium on convenience and ease of use. As a result, free is not always the clear choice. The best way to prevent piracy is by making it easier to buy a product than it is to steal the same product. Despite my many reservations about Kindle’s proprietary DRM, Amazon has made the Kindle book buying experience frictionless. Publishers who fear piracy should work to emulate the Kindle discovery and purchasing process. Right now the number one tool against ebook piracy isn’t DRM, it’s Whispersync. It’s nearly impossible to have a meaningful discussion on the issue of media piracy. Strong opinions and anecdotal evidence dominate every conversation. There is seldom any hard data to back up the various claims of damage or lack thereof. The recent New York Times piece on book piracy is typical of the kind of coverage we’ve come to expect from major news source. The story is long on speculation and short on deep thinking or meaningful data. Meanwhile, O’Reilly Media has just published a new research report on the Impact of P2P and Free Distribution on Book Sales. Written and researched by Brian O’Leary, the report is an all too rare attempt to quantify the impact that various types of freely available content have on sales. Free content has long been used to promote all forms of media. Is it possible that pirated content might serve a similar role in promoting the purchase of content? O’Leary’s early results seem to indicate that might be the case. So first, the good news, courtesy of the A.V. Club: Bob Dylan is putting out The Bootleg Series Vol 8. 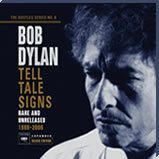 This one — subtitled Tell Tale Signs — concentrates on rare and unreleased music from 1989 – 2006, and can actually be seen as a companion to the very first Bootleg Series, especially since one of the songs on Tell Tale Signs is another version of “Series of Dreams,” one of the more talked-about tracks from that first collection, put out nearly 20 years ago. It probably goes without saying that I love Dylan’s Bootleg Series discs, even if they contain songs I’ve already heard, because not only is the quality top-notch, there are always surprises. I’m very much looking forward to discovering what this one has in store. Best of all, as anybody who has the Genuine Basement Tapes knows, there’s always more where that came from. Yet, this time, there is a problem.